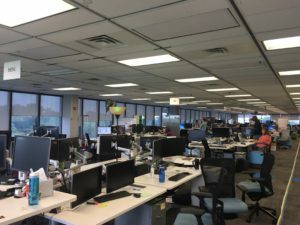 Joe explained why he thinks introverts thrive in this new open workspace, contrary to what you might expect; that they would hole up away from people. 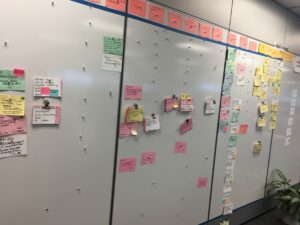 Joe continued, “So the work environment has necessarily evolved, and the (surprising/counter-intuitive) discovery is that software engineers (in general, a highly introverted population) are actually able to adapt in a very positive way to this new environment. As I see it, we introverts don’t actually “change”, there is still a strong bias for some element of isolation. 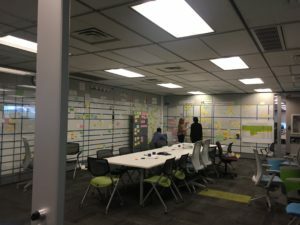 But my experience has been that the human mind is actually much more highly adaptable and without actually being physically isolated, the open environment can be well-tolerated – and the overall team productivity is *greatly* enhanced. 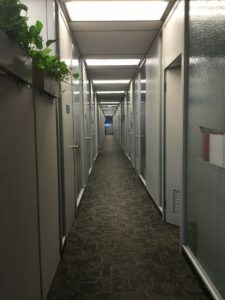 As I mentioned, I can hardly comprehend how we ever got work done in the “submarine hallway” days!” See the photo of the offices Joe refers to at the top of this piece. This entry was posted in Uncategorized on August 8, 2017 by Jennifer Kahnweiler. Thank you, Dr. Kahnweiler! We really enjoyed – and learned from – your presentation here at CAS. Conversations are continuing about the insight you shared. One example is that we are promoting internal TED-style talks. We now know that we can encourage any introverts by emphasizing the large amount of planning and preparation that takes place well before a public speaking event. That along with your encouragement to occasionally step out of ones preferences to build skills helps demonstrate a solid plan. Thank you again for all you shared! Thank you so much, Norm. I am very pleased that CAS is sponsoring these TED-style talks and I hope they will be videotaped! That “push” step is such a critical one for all of us. Do stay in touch and thanks for letting me know about the follow-up.